You’ve waited long enough. Remember that game we played that we wouldn’t tell you anything about? If not, check out our intro to Kenny and his Board Game House to refresh your memories. The wait is over. I feel like every game collector has some games in their collection that they avoid playing at all costs; these games aren’t bad–after all, you kept them–but there is something about them that you want to deal with only on rare occasions. The obvious Monopoly aside, for me, two such games are Apples to Apples and Cards Against Humanity. Now, I want to make this very clear: I love these games. But they get really stale really quickly, when the shock value and surprises of the cards start to fade away. This call-and-response-style gameplay is great when you want to play games with anyone, but for those who play too many times, you will find the same jokes being made over and over again. So then, one may ask why I funded Superfight!, yet another judge based party game off Kickstarter, and then claim that it’s brilliant? Simply put, this game has solved stale. Superfight! is an excellent departure for the ever-growing subgenre of party game I simply call judging games. The concept is simple: each round, the players construct combatants for a gladiator-style battle to the death against the judge’s champion. The winners of each round will be decided by the judge, and any player who has a winning combatant recieves one point. The judge changes each round so everyone has a chance to play both roles. 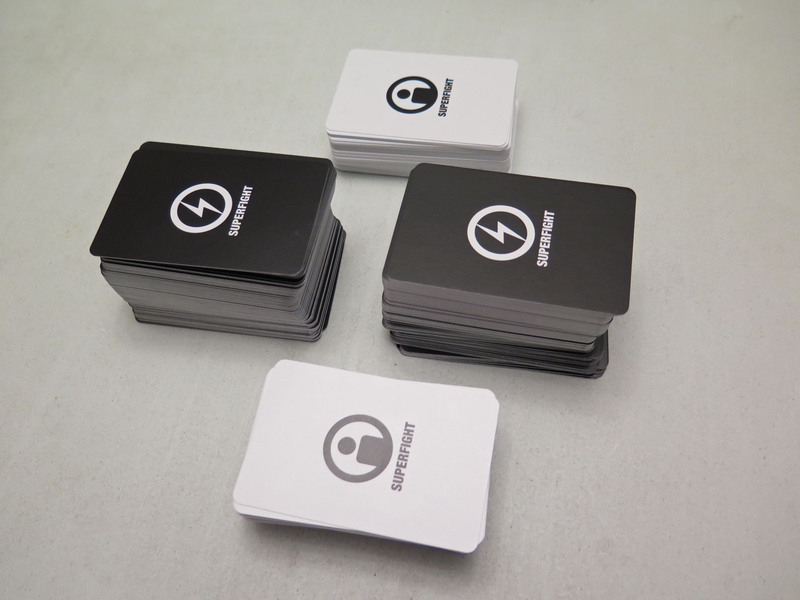 Combatant creation is simply achieved through the use of two large decks of cards, black character cards, and white attribute cards. The judge will randomly create their champion by drawing one character card and two attribute cards off the top of the deck (for example, a samurai that is made of sand and can summon anything from a department store). Each other player builds their battler by playing one character card and one attribute card from a hand of cards they received at game start (someone may have played a T-Rex with a fire hose). After that, everyone gets a chance to place a second attribute card on someone else’s warrior before the battle begins (and now the T-rex is trapped in a giant hamster ball). Once everyone has a character with two attributes, the battle–and the hilarious debate–begins! Judges are encouraged to award multiple points if they feel people have earned it, or no points if they feel no one beat their champion. Of course this requires faith that your judge isn’t a jerk, but if they are, then why play games with them? The problem that all judging games seem to have is that the entertainment comes from the cards alone. Superfight! solves this problem by having a good portion of the fun coming from the best use of the cards, and the discussion of the epic fights. The attribute cards are a slick addition, providing most of the hilarious chaos and giving the game far more life by reducing repetition. Unless you are really bad at shuffling cards, you will not see The Orb of Fire Marshall Sharptooth in a game again for a long time. When playing this for the first time, my guests kept commenting that they didn’t even care if they won or lost, as long as the battles kept being ridiculous and hilarious, which they did. Just like other games with no clear rules on when the game actually ends, setting some guidelines at the start of the game will save your group of players from having your friendly debates turn into actual arguments, or frustrated boredom as two people banter about their battlers endlessly. But these are mostly matters of who you are playing with, rather than a flawed design. In the end, if you are looking for a fun game that anyone can pick up and enjoy, that will entertain you every time you open it with a whole new set of hilarious conversations, Superfight! is worth your consideration. It’s great with a few friends and possibly a drink or two to unwind during the evening. Pretty much every major flaw this game has can be addressed by not playing the game with people who are jerks. It could use slightly more specific rules, but with its active encouragement of players to tweak and find new fun ways to play, Superfight! is far more concerned with having a good time than it is about the specific way to get there. I look forward to seeing what comes next with this game.